The Big Three were a trio of professional basketball players for the Miami Heat of the National Basketball Association (NBA) from the 2010–11 NBA season to the 2013–14 NBA season. 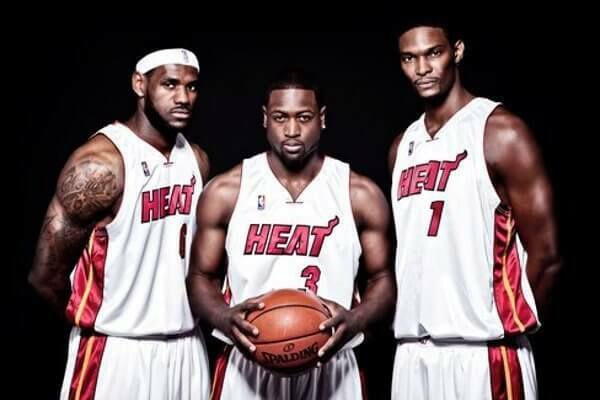 The “Big Three” consisted of LeBron James, Dwyane Wade, and Chris Bosh. All three of those players were selected within the first five picks of the 2003 NBA draft. James was selected by the Cleveland Cavaliers in 2003 and announced his free agent move to the Miami Heat on his TV special called The Decision. Wade was selected by the Miami Heat and played his whole NBA career for the Heat up to the 2015 – 2016 season because he was offered 10 Million for 1 season by the Heat. Bosh was selected by the Toronto Raptors and then signed a free agency contract to play for the Heat. Each of the players from the Miami Heat’s “Big Three” was the franchise scoring leader for the franchise that drafted them. They led the Heat to the NBA Finals in each of their four seasons playing together. Both Dwyane Wade and Chris Bosh continued to play for the Heat for two more seasons after LeBron James left to return to Cleveland before Wade would sign with the Chicago Bulls and Bosh would consider medical retirement due to continuous blood clots before the start of the 2016 – 2017 NBA season.